TABANOVCE, the former Yugoslav Republic of Macedonia – On a bleak, cold day in late February, hundreds of refugees, bundled in winter coats and carrying bulging bags and baskets, stream into the Tebanovce transit centre, stationed on the border between the former Yugoslav Republic of Macedonia and Serbia. Most have been travelling for months, and will likely only rest here for a few hours before hoisting there bags back up to move again – on into camps in Serbia and other neighbouring countries. Each day, an average of 2,500 refugees enter the former Yugoslav Republic of Macedonia, the majority fleeing conflicts in Afghanistan, Syria and Iraq – and the hectic scene in Tabanovce has become a daily routine. But today there is a notable difference. 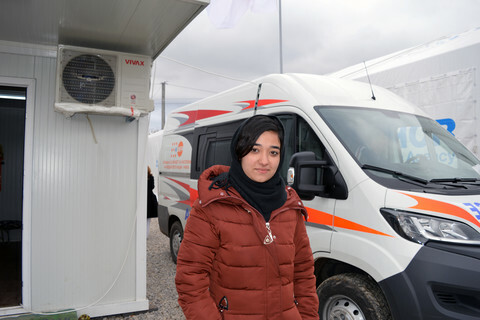 It is the first day that UNFPA’s new mobile clinic will be providing women in the transit centre with much-needed sexual and reproductive health services. Morsay, age 16 and pregnant with her first child, is one of the clinic’s first patients. She arrived at the centre with her husband, Shagah, age 37, after two months on the road, travelling from their home in Kabul through Pakistan, Iran, Turkey and Greece, before journeying to Tebanovce. “We were afraid to take the trip because she is pregnant, but we had to go,” says Shagah. “In Iran, she had some problems and had to stay in the hospital for a week.” He adds, nervously, that this is her first check-up since her discharge. The clinic doctor, Dr. Lidija Jovceska examines Morsay. And then, with the assistance of Qudsia Qurbani – an adolescent refugee from Afghanistan who has agreed to serve as translator with the clinic's Farsi-speaking patients, she tells the relieved couple that both Morsay and the baby are doing well. With 60 million people displaced from their homes in 2015, the world is currently facing its largest refugee crisis since World War II. Over one million of those individuals fleeing violence and disaster in their own countries crossed into Europe last year, and 55 per cent of the refugees entering the continent through Greece in early 2016 were women and children. Many of the women are pregnant and face increased risks of complications as they travel through conflict zones and over large expanses of land and sea. And this vulnerability is further compounded by the fact that a large number, like Morsay, are adolescents – a population much more likely to face complications and death during pregnancy than women in their twenties. As a result, approximately 60 per cent of preventable maternal deaths worldwide occur in settings of conflict, displacement and natural disaster. Refugee women are also much more likely to suffer sexual and gender-based violence (GBV), and may be in urgent need of GBV treatment and counselling. However, despite these elevated risks and the resulting need for services, quality sexual and reproductive health care is often scarce and hard to access amidst the instability. In addition, in recent days, due to increasing border closings along the refugee route through the Balkans and into Northern and Western Europe, thousands of people have been unable to move to their next destination and are stuck at camps and transit centres, like Tebanovce, resulting in even more severe overcrowding at the already packed and strained facilities. The Tebanovce van is the second UNFPA-supported mobile clinic in the country. The first has been making weekly visits to the Vinojug transit centre on the border with Greece, which receives the largest number of refugees transiting through the former Yugoslav Republic of Macedonia. 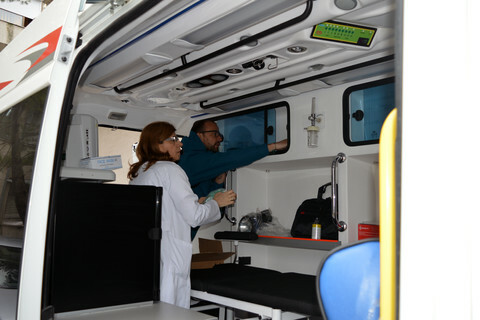 UNFPA worked closely with the Ministry of Health and medical teams from Kumanovo and Gevgelija city hospitals to prepare and dispatch the new clinic. And they expect to continue to add mobile clinics to their fleet throughout the year, ensuring that they can accommodate refugees throughout the country, whether they are stuck at a border or in transit. Soon, Dr. Jovceska finishes with her last patient and closes up the van. Tomorrow, hundreds of new women will stream through the centres gates – and the mobile clinic will drive in right alongside them and open its doors.